All it’s missing is 3D Mode, to be honest. So this is a fun, but worthwhile review right out of the box. As a child of the 80s (Dec. 1981!) arcades were a magical thing, blossoming into their own identity. They were everywhere, and full of bright colors and wonderful audio. From the chomping of Pac-Man to the exploding ships of Galaga, there were so many things to experience for the first time. But you know what games always had the coolest, stand-out cabinets? 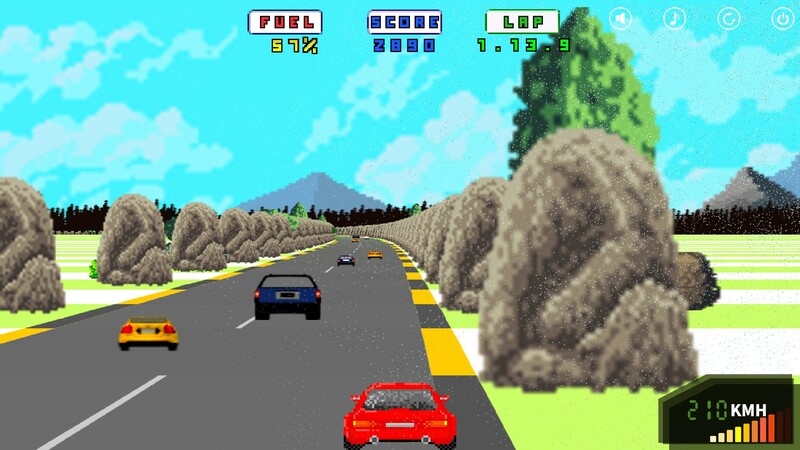 Racing games. No matter how bad I was at them, they looked so damn cool! And today’s review takes me back in time to those good ol’ days, but this time, I actually completed the game! I got through all 15 stages, and while I did terribly, I still got there, and that’s what counts. Today, I am reviewing ‘My 1980s Dashboard’. Now, I know what you’re thinking: What a weird, awful title! It sounds like a standard Steam asset flip! So many scenic areas, with so much lovely music. That’s where you’d be wrong, kiddo. Dashboard is something wonderful and special. It’s 15 stages of racing fun, with a very decidedly 1980s racing palette/aesthetic. 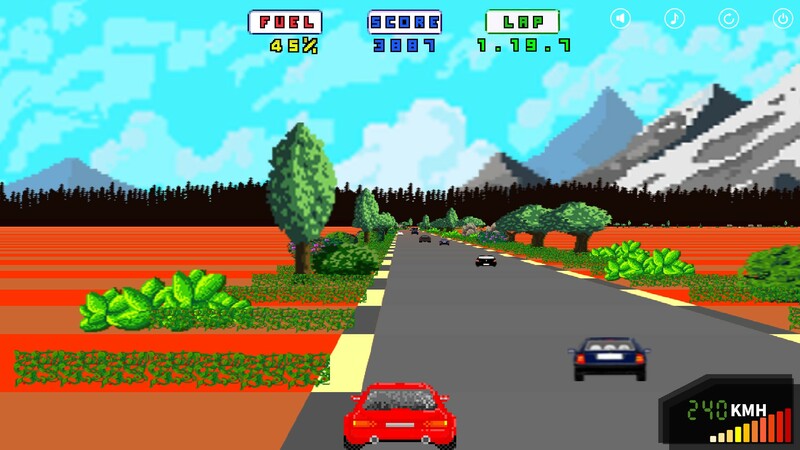 You play as the racer, in a very familiar-seeming car. It’s a very cool car, a radical racer if you will. If you thought for even a minute I wouldn’t work that in, you would be wrong, quite wrong. There are 15 stages, where you dodge and weave around traffic, going up to 240 KMH, trying to get to the end of the race before you run out of fuel. However, the fuel keeps ticking down no matter if you’re stopped or going. It’s a car, and it is still on, you guys. Consider it a timer, and it only jumps serious numbers if you hit another car, or go off the road, then a chunk of the fuel disappears. I kind of wish that number didn’t feel so serious, because a few collisions and you’re not going to finish a race. 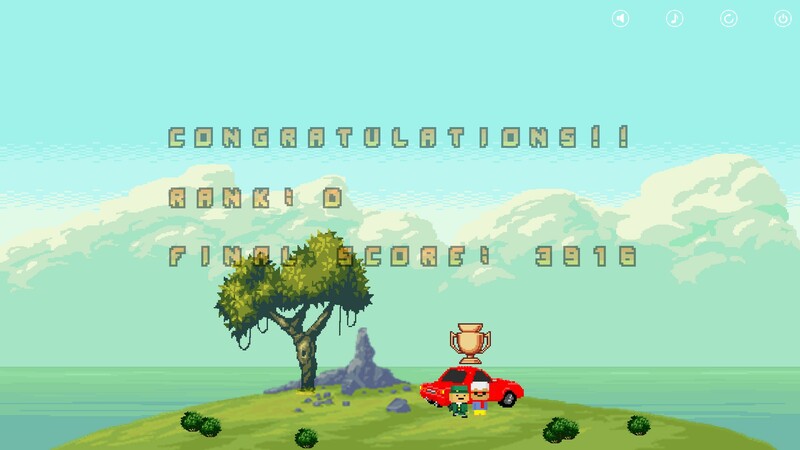 The game has multiple endings though, which are entirely based on your score, so getting to the end faster with fewer collisions (none is the ideal number) will get you much better endings. This isn’t the worst by half. I was too busy racing to take dangerous screenshots. I love this though, it’s very relaxing until the traffic really starts to clutter. You cannot (or should not) just keep the hammer down and accelerate the whole time. You control it with either WASD or the direction pad, whichever you prefer, but if I’m being honest, I’d love to play this with a steering wheel for PC. I don’t really know if you can, but as I don’t have one, I can’t test it. W or the Up Key will accelerate you, and hitting left/right while on a turn will likely give you a deep screech as your tires struggle against the pavement, at least while still holding accelerate. For the most part, the cars on the road are pretty passive, like the sedans/station wagons will typically just stay in place and move forward, but in the early races, watch out for the white sports cars. They will dodge and weave through traffic, and will not hesitate to hit you to get ahead. In the later races, the dark blue sports cars will also do this, and occasionally the yellow cars. It’s only really horrifying when the cars are all cluttered together because it will likely result in a hit. Being hit by a car or the side of the road will decelerate you immediately, down to 20 KMH or less. Getting caught here might mean the end of a race. However, the other cars don’t have to worry about this. In fact, it seems like they get even faster! 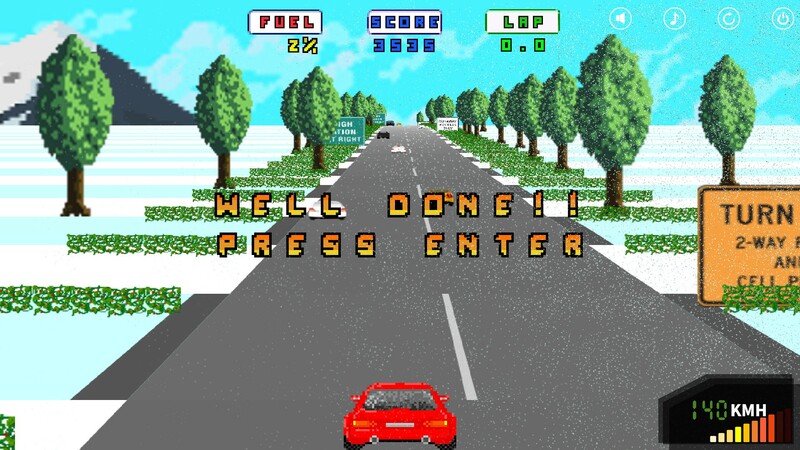 This is frustrating but not when I consider this is how the games back then worked, and this is a loving tribute to 80s racing games, after all. There are weather patterns, but they don’t really seem to affect the gameplay, they’re just nice to see. Each race has a different pattern, but you can’t see the track ahead and just have to guess. They aren’t random, so simply racing the same one a few times (which is bound to happen) will give you ideas on what to expect. It’s important to know when to slow down and when to speed back up, and for the most part, when cars leave your screen, they’re gone forever. Well, that is until about the halfway point (stage 6 or so), if you hit a car after passing someone, there’s a chance those cars behind you will suddenly be there again, and I’ve had moments where I hit a car, slowed to a crawl, and as soon as I sped back up, a white sports car would zoom out of nowhere and hit me, putting me back at 0 KMH. My goodness did that make my blood boil! Not at the game, but at myself for being so damn reckless. That would have been another quarter, back in the day! I’m so bad, but this is so good. This is a two-dollar game, and it has all of this. It’s a wonderful tribute to the racing games of old. The controls are incredibly tight, and with practice you and weave through traffic with the best of them. The only serious issue I had was the occasional freeze/frame skip, but they did not happen all that often. The chiptune music is lovely and relaxing, though you can turn the sound/music off if that’s what you want. And it’s a racing game with alternate endings, so it even has replay value. Go back and play again to try and get a better score! It’s 100% worth it! There’s also the “retro”/dashboard mode, where the screen is smaller, but you see a steering wheel/gearshift, all that cool stuff you’d see in a sit-down arcade cabinet. They recently added the full-screen traditional mode, which is what I prefer, but the retro mode is also pretty damn awesome, just to do from time to time. In many Steam games, you get what you pay for. But with Dashboard, you get so much more. 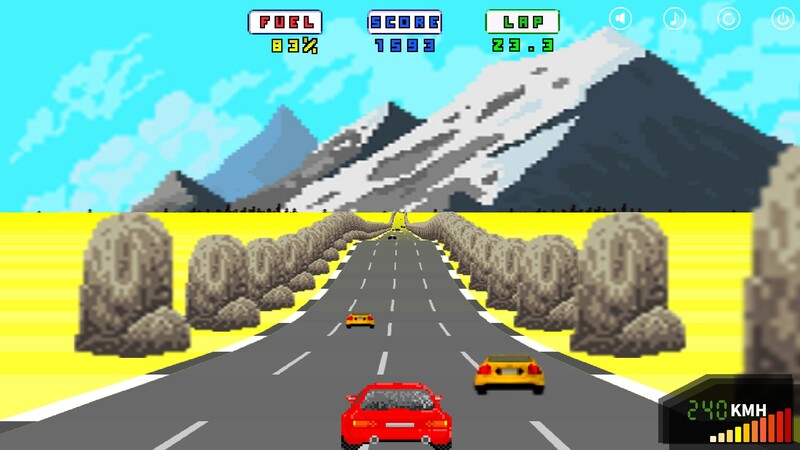 If you’re like me, love retro games, enjoy the challenge of a good race, and want to take a trip back in time, look no further than My 1980s Dashboard. It was a genuinely fun time that I do not regret. I would recommend it to anyone looking for a bit of nostalgia. A code was given to review this game.